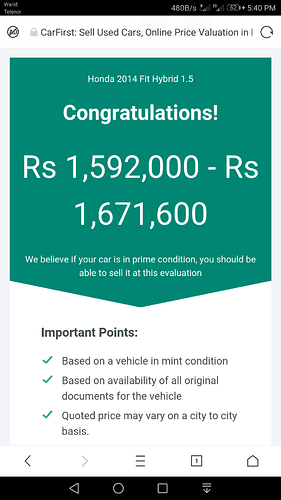 its really a very good car the acceleration is unmatched no 1.8 can come even closer to it be it premio civic or grande the ride is very comfortable and build quality is very good plus it sporty shape and road grip are great and great it gives around 20-22km/l yes parts will be issue in sargodha but regular maintenance is not issue as most parts are of vezel in it. The best buy is package L considering the price. S is top spec model but price is very high. You should get a Good 40k-50k driven 4/4.5 grade in max 18.5lac exclusive of registration but without an auction sheet you can get L package in even 16.5 lac easily. I am also interested in buying this car but in a dilemma as I owned altis 1.6 2016 model and unable to decide whether I keep 1.6 or sell and buy S version of honda fit. where did i say fit is better than aqua in repect to economy and sale ??? and about drive fit is far better than aqua if you have driven both you will get idea not from social media star and the difference between boths mileage is just 19/20. Also I dont like Aqua's interior ... looks very ordinary... as compared to that fit has much more stylish interior. I love my altis but fit again and again puch me to think to make a change. and by the way i had fit for just 2 weeks while i sold my Prius and bought aqua and loved it after prius its seating position and smooth drive was really great but just press fit acceleration pedal and a devil smile will come to your face it is such strong you cant believe. Honda fits were notorius for DCT transmission errors. Please check the complete history of the vehicle from honda Japan before buying. I didn't understand , please brief me in general words. Bro how is the suspension of fit? Is it stiff? I am also considering buying fit for daily use. I hope it’s worth it.